This project aims to develop activities at different scales that will guide CCAFS synthesis, engagement and support across the regional portfolio. 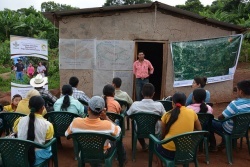 Local activities are related to the implementation of climate-smart agriculture (CSA) technological packages, as well as implementation of strategies to engage at community level in Latin America’s climate-smart villages (CSV) in order to create evidence to scale up and out the CSA approach through national and regional level stakeholders. National and regional activities will include addressing priorities in the region, and context-specific actions and interactions with partners, governments and research centers will lead to the formulation and implementation of policies and strategies on climate change, agriculture and food security. CSV approach implemented in Latin America will provide scientific evidence of how CSA practices are helping farmers to reduce agro-climatic risks and what are the costs and benefits associated to CSA practices implementation. At least 10 CSA practices will be tested and examined in Latin America CSVs considering particularities regarding gender and youth challenges, supporting decision making across levels. Evidence gathered from CSVs test and evaluation exercises will be used as inputs to inform policy processes across scales. This project has a significant focus on generating robust CSA practices and technologies data that demonstrates their effectiveness and benefits to implement them at large scales in Latin American countries. GHG Measurements and modelling at local scale where several CSA practices and technologies are being implemented provides insights on how adaptation and mitigation actions can provide benefits to smallholder farmers. Therefore, this project will provide data and analysis on how a portfolio of options interact to evidence the effectiveness of CSA, and contribution to mitigation at local scale. 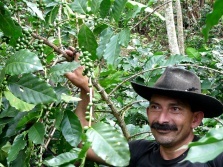 Based on the evidence gathered through the implementation of Local Technical Agro-Climatic Committees subnationally and the implementation at local level of PICSA and low-cost climatic networks, it is expected that within this project governments take concrete actions to include climate information as a key priority for investment in order to support decision making process in the agricultural sector. 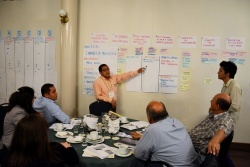 In addition, index insurance participatory process implemented in Honduras is expected to scale to other countries in the region. The engagement with government and multilateral organizations constitutes a key element of this project through which CCAFS is able to technically support countries in challenging topics such as food and nutrition security, especially in Central America. Through this project, CCAFS will support policy formulation and decision making processes providing tools and methods that can support addressing food and nutrition security in the region. This will include capacity strengthening and technical support, accompaniment to decision makers and technical government personnel.